Two former Navy guys jumped ship from their careers in banking and engineering to pursue a passion for whiskey and open one of Baltimore’s first distilleries. 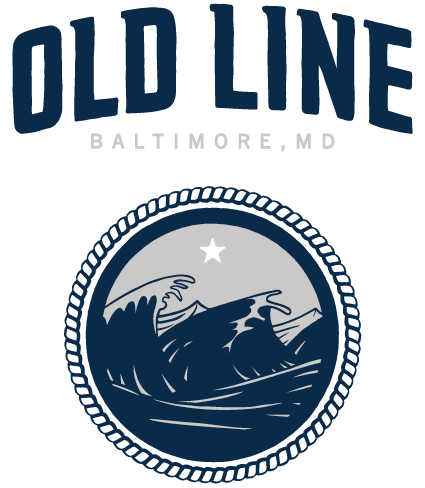 Mark McLaughlin and Arch Watkins, neighbors in Butchers Hill and friends from their time in the Navy Reserve, will soon begin producing American single malt whiskey in Baltimore at their forthcoming distillery, Old Line Spirits. Their path to owning a distillery was an uncommon one. Most distillers in Baltimore start from scratch, but McLaughlin and Watkins bought an existing distillery on the West Coast that they’re rebranding and relocating to Baltimore. Both McLaughlin and Watkins served in the Navy. McLaughlin later pursued a career in investment banking; Watkins took an engineering job with the Johns Hopkins University Applied Physics Laboratory. Both liked the idea of owning their own business, and both had an interest in distilling as they saw the market taking off in Maryland. About a year ago McLaughlin quit his banking job in pursuit of owning his own distillery. Watkins joined McLaughlin in October and came on board full-time in January. “I had this technical skills set, he had the financial background,” Watkins said. “It just seemed like a natural fit for me.” One of the first things McLaughlin did was attend the American Distilling Institute conference in Seattle, where he met one of the owners of Golden Distillery in Washington, who was looking to sell his distillery and retire. “It just was serendipity really,” McLaughlin said. The partners ended up buying Golden Distillery and closed the deal about a month ago. McLaughlin declined to disclose the purchase price. The biggest perk of acquiring that distillery was acquiring the product that came with it. The partners have about two years worth of supply produced by Golden Distillery that will be rebranded under the Old Line brand. “It’s a known factor; we have product that we know is great,” McLaughlin said. “We don’t have to make something now and wait two years to see if it’s good.” McLaughlin and Watkins are still negotiating their lease, so they declined to disclose the prospective location of the distillery. They expect to have the lease finalized within the next 30 days. 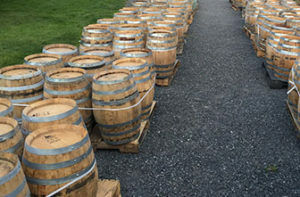 Once that’s settled, they plan to begin distilling their own whiskey — made with the same ingredients and in the same process Golden Distillery used — later this summer. McLaughlin said they expect to produce about 1,000 cases in their first year. They plan to add new equipment in their first year, after which they will have the capacity to produce up to 12,000 cases annually. The partners said they will start by focusing on whiskey production, but they’re open to making other spirits, too. Old Line Spirits joins Louthan Distilling, the city’s first distillery, but they won’t be alone for long. Under Armour Inc. CEO Kevin Plank’s Sagamore Spirits is also getting closer to breaking ground on his distillery.